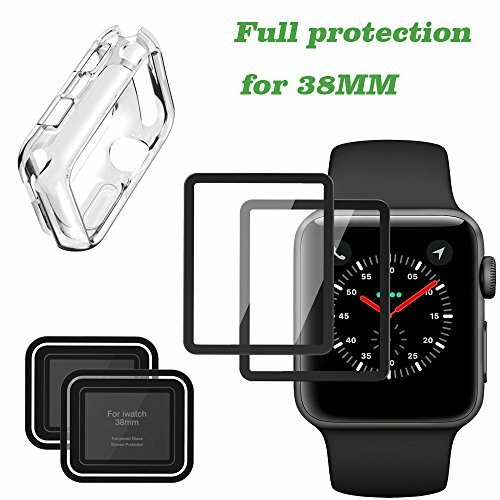 This Apple Watch Screen Protector and iphone Watch Case Fits for series 2/3, 38mm Solved the problem of offering external surface protection to your watch without compromising usability. Delivers instant all around protection from scratches and minor dents,High touch-screen accurate & sensitive, yet exhibits the watch's true color. -Curved Edges: Perfectly fit on your curved screen, ensure protection from edge to edge. -Protect your Apple Watch Screen from scratches, dust and daily wear and tear. - 2 x Alcohol wet cloth. Full Coverage: Designed with glues around the black edges and cover the whole screen, apply 2.5D curved cutting technology to fit on the screen perfectly. Scratch-Resistant: 360 degree full protection,you don't have to worry about your watch .This tempered glass screen protector with strong 9H to protect your iphone watch screen from bumps and scratches hardness. Fingerprint Resistant:The high quality glass material that reduces fingerprints and oily streaks,keeping your apple watch always clean and new. High Definition:It's a premium smooth, crystal clear quality TPU case.99.99% transparency allows you original screen display,flawless touch screen accuracy when operating the programs. Kindly Remind: The Apple Watch has curved edges and this screen protector covers only the flat surface including the entire view able area of the display. 30days money back after the date of purchase, contact us anytime if you got any problems. If you have any questions about this product by Herozone, contact us by completing and submitting the form below. If you are looking for a specif part number, please include it with your message.